The race track that today bears the name of Enzo and Dino Ferrari, lies besides the wild river Santerno, which has its origin in the historical Park of the Mineral Waters (hence the name of the Acque Minerali corner), and is the prime reason for the run-off area at Tamburello being too tight - making it one of the most dangerous corners in the world until Senna's fatal accident spurred on track changes that also emasculated the once great Tosa corner. Today hosting the San Marino GP, the circuit is in fact situated 50 miles from the principality, in a town on the border between Emilia and Romagna, between people who have a great passion for motorcars and feel deeply connected with Ferrari. 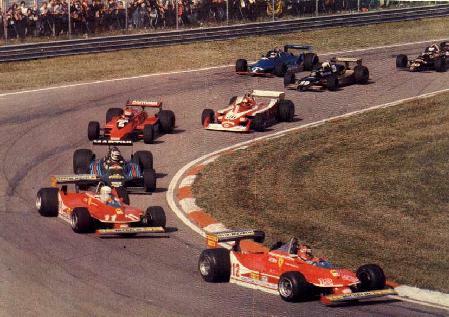 The Ferrari team has been very much involved in the creation of the original Imola track, which used to be fast and furious, with daunting high-speed turns, instead of today's stop-and-start straights and chicanes layout. The first contact between Ferrari and Imola dates back to 1948, when Enzo Ferrari was invited by the local Motor Club to express his views on how to build a race circuit. It was an idea only, which subsequently took a lot of years to finally become reality: on 25 April 1953 the circuit was inaugurated. So when in 1979 the track got its international license, the track owners decided the circuit which had been created on the basis of the design hints by the Great Man himself, should be renamed Autodromo Dino Ferrari, after Ferrari's beloved accepted son Dino, who of course died at a tragic young age. As a gesture of appreciation an inaugural race was proposed, which would take place a week after the Italian Grand Prix at Monza. For a moment, the event was in doubt because of an earthquake hitting the region, but in the end the Gran Premio Dino Ferrari could go ahead as planned. 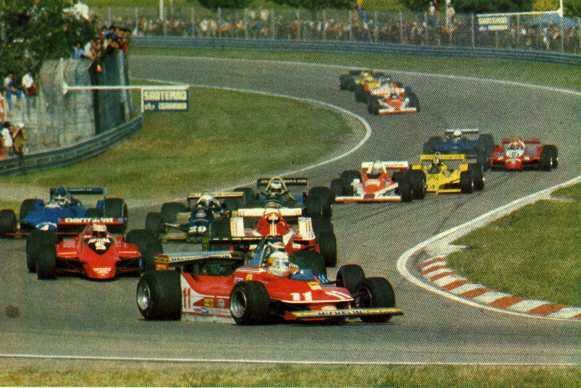 The event (here we are witness to the start, with Gilles already out of sight at Tosa) is to be remembered best as Niki Lauda's first swansong, as it brought Lauda's last victory in his first era as a racing driver, in his last race for Brabham before packing up in Montreal practice. Every F1 team vaguely involved with Italy someway or another came with at least one car, Ferrari of course turning up with 312T4s for both Scheckter and Villeneuve (Gilles in a B version), the Scuderia on a high after taking the World Championship with a striking one-two at Monza just days before. Alfa Romeo, just back in business, even took three cars to the event, a spare 177 on hand for Bruno Giacomelli and Vittorio Brambilla. The "mediterrenean" touch was further provided by Martini & Rossi (sponsoring Reutemann's Lotus), Candy (sponsoring Jarier's Tyrrell), Parmalat (Brabham sponsor), Elio De Angelis and Beppe Gabbiani (the latter doing a one-off for Shadow), Arturo Merzario (who brought his own car) and Riccardo Patrese (bringing his Warsteiner Arrows). Others feeling obligated were McLaren who came with Patrick Tambay, and Wolf who arranged for the Olympus-backed WR8 to be run for Keke Rosberg. The Fittipaldi team had another surprise one-off in store, fielding Alex Ribeiro as a taster for his North American World Championship double header which was to follow just weeks later. The event also saw the peculiar entry of Team Agostini Marlboro, a two-car outfit entered by multiple bike champion Giacomo Agostini. The team fielded elderly Williams FW06s for their team boss and Carlo Franchi, better known as 'Gimax'. With his Aurora team Agostini had also appeared in the Race of Champions earlier in the year, an event which saw an abundance of Aurora cars taking on just a handful of World Championship regulars. 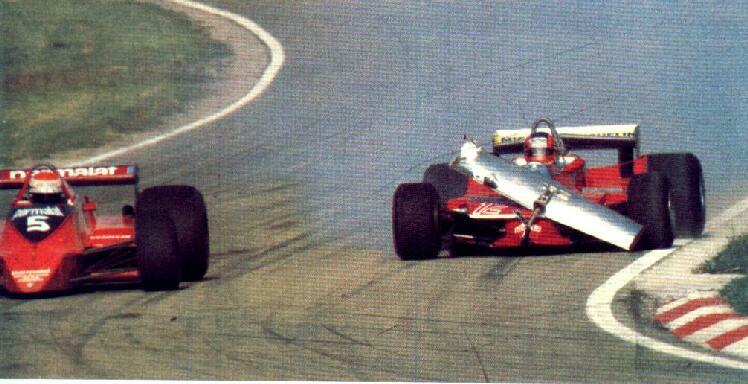 Alas, the race itself was a disappointment, the only spectacle provided by Gilles Villeneuve (who else?) who tried to dislodge Lauda from first place approaching Tosa after failing to convert his pole into a leading position by mid-distance. 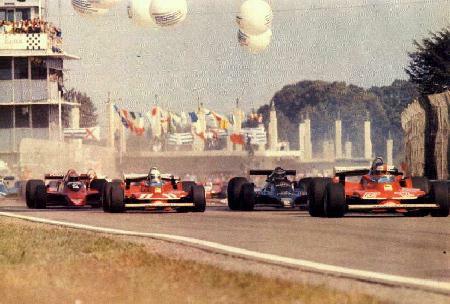 Niki survived the attack and quietly moved on to win the race, while Gilles had to return to his pit with a severely bent nose... For Alfa, it was also to be their last victory in an F1 race, since they would not return as an engine supplier to Brabham, instead focusing on their own effort as a constructor. This, however, would not pay off in the way it did in the early fifties. Remarkably, the winning BT48 - which clearly shows the lines of the ultra-successful BT49 - did not convince Lauda to stay on for the 1980 season. In fact, the Austrian tried the Cosworth-powered version of the BT48 in Canada before deciding he'd had enough. Probably his state of mind was already set on retiring, rather than backing off on the idea having tasted the wonders of the BT49. In a way the move opened up a way for another triple champion as it meant a sudden advancement into the limelight for Nelson Piquet, who did not hesitate to put Gordon Murray best-ever design to good use in the years following.